A flow chart is pictorial representation of an algorithm. It gives an easy and clear understanding of an algorithm. 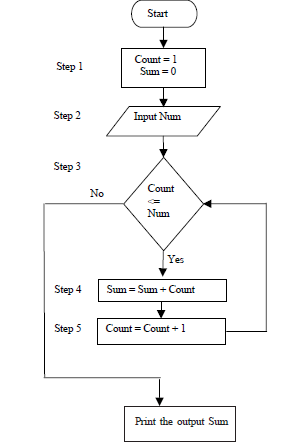 The understanding of an algorithm is made easy by flow charts, as compared to textual representation of an algorithm. This is usually to represent terminal points in a program like BEGIN, END, START, and STOP. The rectangle represents the processing operation. A process changes the data. An assignment is usually represented by this symbol. Lines or arrows represent the flow direction - the flow of control. Normally the flow direction is from left to right or top to bottom. A broken line and rectangle represent the annotation function - the addition of descriptive comments or explanatory notes for clarification of some statements. The diamond represents a decision or switching type of operation that determines which of the alternative paths is to be followed. A decision points out a question that can be answered yes or no (or true or false). A Circle is connector symbol which is used to represent functions in a flow line i.e. the part of flow chart which continues in the next or another page. The double sided rectangle presents a named procedure that consists of one or more operations or programming steps that are precised elsewhere such as a module or subroutine. Step 5 Increment Count by 1.